Did you know that certain genres or songs can make us really feel happy? I'm sure you had a bad day one time and then you hear this music and it sort of uplifted you. Apart from that, seeing live music can reduce your stress hormone levels. Add some more singing to it and you have got yourself a greater feeling of well-being. Music has that power! As the weather starts to warm up this Summer, wouldn't it be great to be with friends and family and along with your cold drinks, enjoy a great ambiance made more special by a special musical performance? You need to de-stress every now and then, which is why I have the perfect suggestion for you. 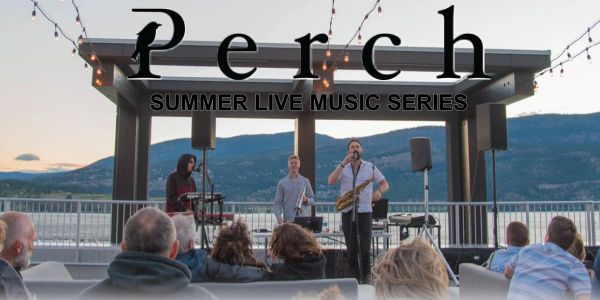 Every Saturday throughout the Summer, the Perch Café in Kelowna, offers a Summer Music Live Series. Happening at Kelowna's best rooftop patio, overlooking into the beautiful Okanagan lake, what more can you ask for? It's perfection. Another great tip: If you have a particular song that evokes strong emotional response or inspire you, check if the band can play that for you. It might make your Summer a completely memorable one. Click here to check out the schedule of performances and other great offerings by the Perch Café.